Is there anything more frustrating than when your watch stops telling the time? The beautiful timepiece that adorns your wrist is likely to be powered by a quartz battery (unless it’s an expensive mechanical watch), but unfortunately, these tend to last for not much more than a couple of years. Too many people see their battery failing as a Doomsday scenario. Yes, it’s an inconvenience, but it’s hardly the end of the world. Getting your watch battery replacement is really quite straightforward and not exorbitant. The first thing to do is to find a watch service centre that will provide a watch battery replacement service, which almost all of them should do. You should be able to find one near to where you live, and, as long as they have a good reputation and are well reviewed, they’ll remove your old battery and replace it with a fresh new one. Another incentive to deal with a dead battery quickly, rather than let the watch gather dust, is because expended batteries run the risk of leakage into the watch case, which can affect the contacts and lead to them needing to be replaced or, worst case scenario, causing the movement to fail completely. 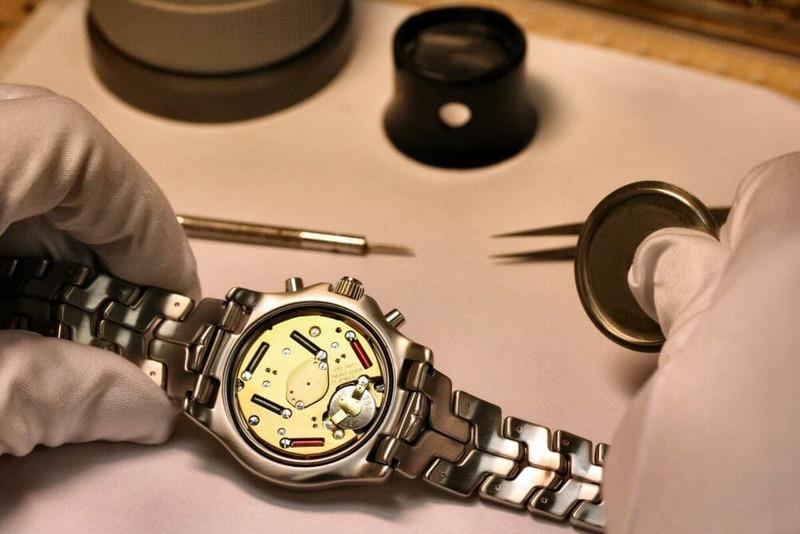 • Silver oxide – This is the most common type of watch battery. Its high energy-to-weight ratio means that it lasts a long time, but the silver content makes the batteries expensive to produce. • Alkaline – The cheapest but not the most powerful type of battery in a watch. These are often found in bottom range models and can run out of energy in a matter of months. Users may also experience timekeeping issues because of inconsistent voltage from the cheap battery. • Lithium – Although small, lithium batteries pack a serious punch, with a capacity of 3 volts, which is the highest available. They can last for up to 10 years, if used in a low-drain watch. • Mercury – Typically smaller than lithium batteries, Mercury batteries have a capacity of 1.36 volts. Although its endurance is similar to that of an alkaline battery, its voltage is more consistent. The big downside to mercury batteries is that, as an element, mercury is highly toxic, so disposing of a used battery is a risky procedure. • Solar – Solar cells are powered by light that reaches the watch face itself. Citizen is an example of a high profile brand that has embraced this battery technology. The main advantage is that this energy source is sustainable, so you never have to change your battery. You may even want to hug a tree after using a solar-powered watch! Although there are other types of battery, these five are the main ones, with silver oxide and lithium being the most common. A reputable watch service centre should be able to replace any of these types of battery with little fuss and at a relatively low cost.